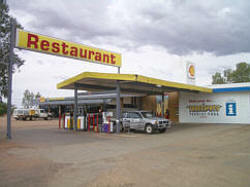 Threeways Roadhouse, at the intersection of the Stuart and Barkly Highways, offers great food, fuel, visitor information and a comfortable overnight stay. Motel rooms and cabins are air-conditioned. Shaded camping and caravan sites are available, pets are welcome. Nearby is the memorial to Rev John Flynn, founder of the Royal Flying Doctor Service and Inland Mission.